There’s no better way to spend a cool fall evening than curled up on the couch writing, reading, or binge watching one of these Netflix shows (Riverdale, anyone?) 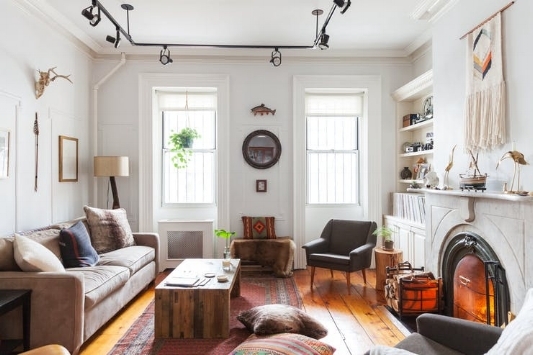 These cozy living rooms are the perfect way to escape the everyday and relax in style. I'm a firm believer that you don't have to go crazy with seasonal decorations. I love Christmastime just as much as everyone else, but I like to see how I can subtly incorporate those seasonal elements in a natural way that doesn't feel too commercial or cheesy. These interiors accomplish just that! This gorgeous Spanish style home has the most amazing windows! 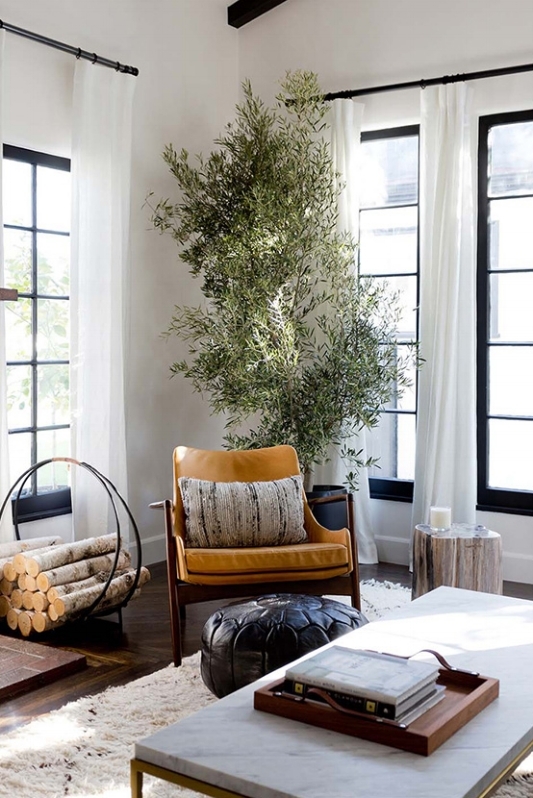 The natural light and stark white walls feel much more cozy with a warm-colored chair and lush greenery in the corner. I love the firewood basket as well for fall—The simple design is just bold enough to make a statement. I love everything about this room! The burnt orange hues mix perfectly with the fuchsia oriental carpet and the beautifully painted fireplace. I'm a fan of living spaces that have tons of layers, and this room is full of detail. 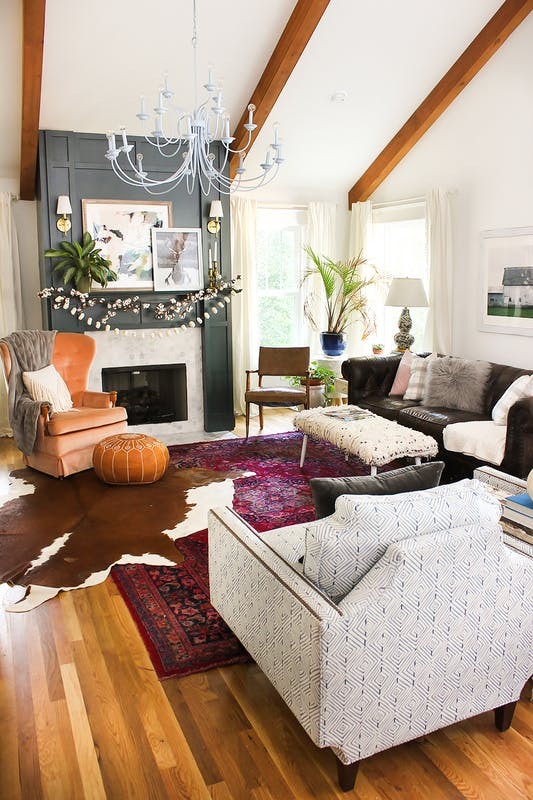 From the furry pillows to the threaded cotton hanging on the mantle, this eclectic space is perfect for fall! A gorgeous piece in any home, this Midcentury couch adds a moody vibe to this living space. This rich shade of maroon, layered against a plum-colored wall in the background, is perfect for lounging on a gloomy fall day. Dying plants, books strewn about, and unfinished canvases give the room a brooding feel. Individually, the pieces found in this living room aren't my favorite... But together they work well! The fireplace is the centerpiece of this room, with its beautiful details and dark steel frame, but it's balanced well by the unique light fixture hanging from the ceiling. Wall hangings, especially the tapestry above the fireplace, make this room feel bright and warm. This is *technically* an entryway, BUT I love the pillows used on this bench! Velvet is having a moment this season, and the ornate design on the accent pillow blends perfectly with the stain of the bench and the cream blanket draped over the side. As for wall art, these gourd + plant illustrations take fall decor to a more chic level! I'm not sure I could live with these burnt orange walls year round, but I love the use of this color in this case. Using bold paint choices that can easily transition from season to season is a surefire way to make a statement, and picking a color with warm tones will make your living space feel infinitely cozier. Spark visual interest by adding a bright-colored couch, a funky earthy painting, and a natural wood table. THis living space is rich in texture, pattern, and color! Thick woven pillows, a tapestry on the footrest, and a gorgeous printed rug make the space feel cozy and warm! The single pumpkin placed on the side table between the couch and bookshelf is the perfect hint of fall. If you need me, I’ll be lounging around on my couch with my Trader Joe’s Vanilla Pumpkin scented candle burning and laptop in my lap!